Roasted Tomato Margaritas put a twist on some classic cocktails. 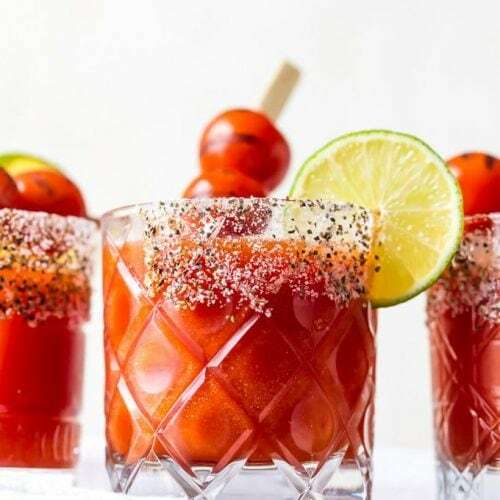 Mix the tequila and lime juice of a margarita with the tomato juice of a Bloody Mary, and you’ve got one fun and delicious drink! This easy margarita recipe is sure to please; it’s always a hit at parties! 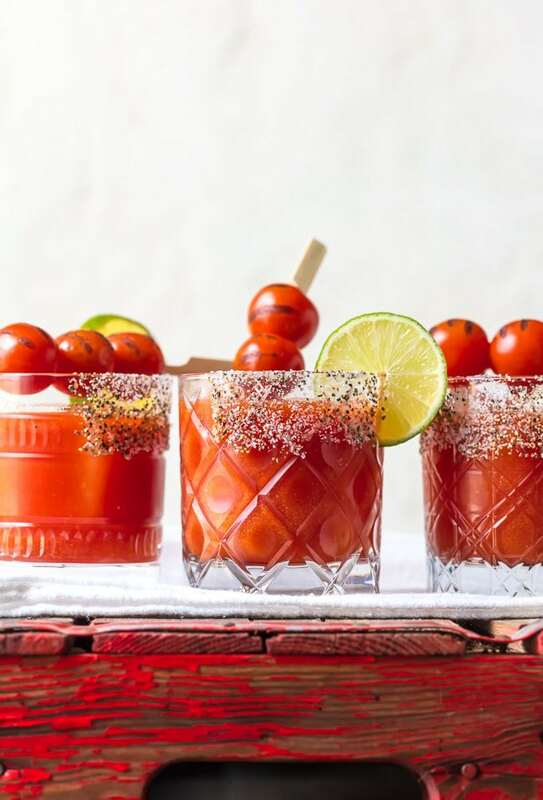 Make your own roasted tomato puree, mix it with tequila, and pour it over ice. Yum! 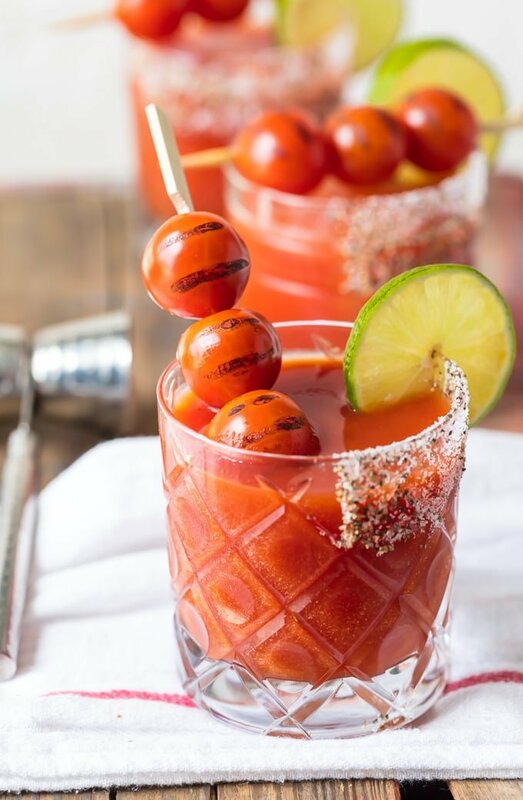 This Roasted Tomato Margaritas recipe will surprise you with how good it is! Add a fresh tomato puree to a classic margarita and you’ve got a delicious cocktail to serve all season long. If you’re new around here, you might not know this (although you will catch on quickly), but I LOVE margaritas. There’s nothing better than a classic margarita over ice, a perfectly blended frozen margarita, or a fun flavored margarita to try something new. And that’s what today’s recipe is: a new margarita flavor you all are going to love. Roasted Tomato Margaritas are one of my new favorites and I just can’t get over this incredible FLAVOR. You start by making your own roasted tomato puree and then mixing it with tequila, lime juice, and ice, as you would in a classic margarita. The puree mixes fresh cherry tomatoes, garlic, olive oil, salt & pepper, and a bit of chili powder for a super savory and slightly spicy flavor that blends with the tequila so seamlessly. Rim your glass with salt and chili powder for an extra kick! 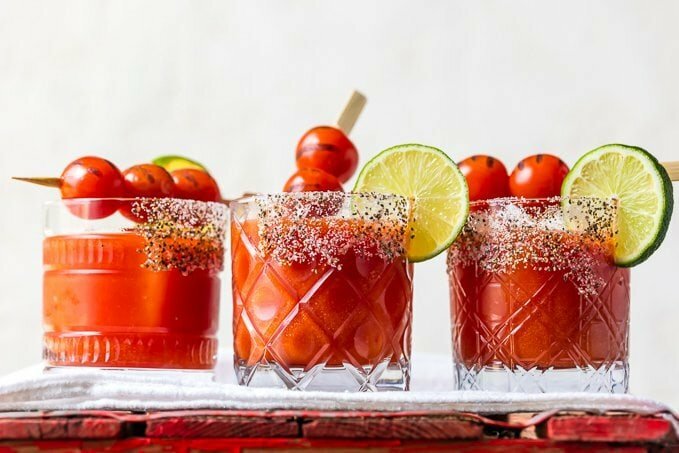 If you’ve ever had a Bloody Mary, then you know how great tomato juice can taste in a drink…and this margarita recipe might just become your new favorite tomato cocktail! 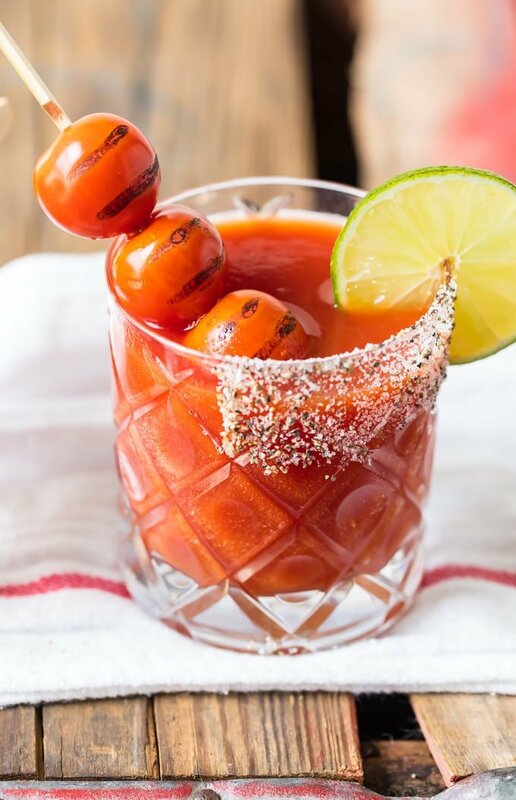 This tasty Roasted Tomato Margarita recipe will blow your mind. It’s so delicious and so much fun! I think one of my favorite things about margaritas is the fact that they’re all actually so easy to make. A classic margaritas is just a few ingredients shaken together with ice. That’s why I love coming up with new margarita recipes, because you can easily customize them and make something different by adding a couple more ingredients into the mix. This easy margarita recipe is just your basic margarita mixed with a tomato puree. 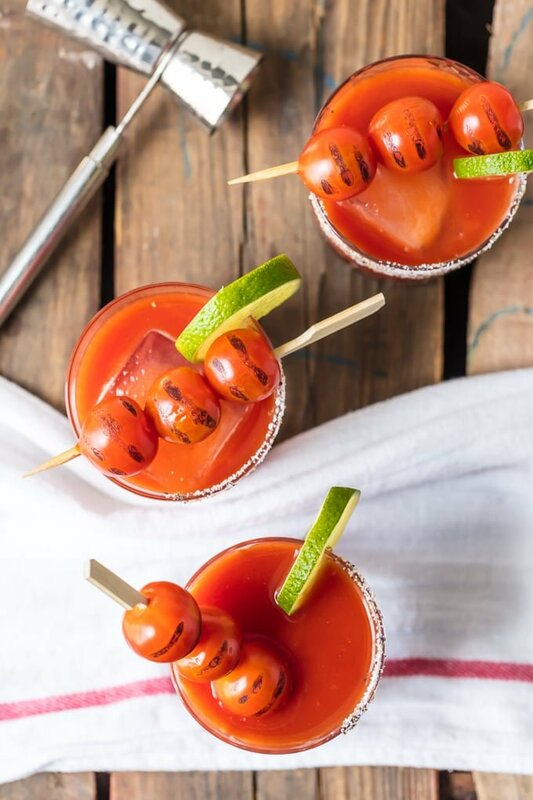 Roast up some fresh tomatoes, season, and blend into a smooth consistency, then shake it up with tequila, lime juice, and ice. 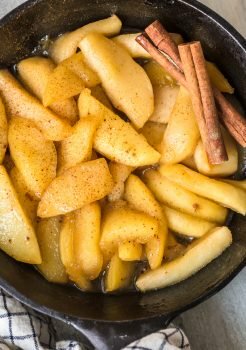 So simple and so tasty! 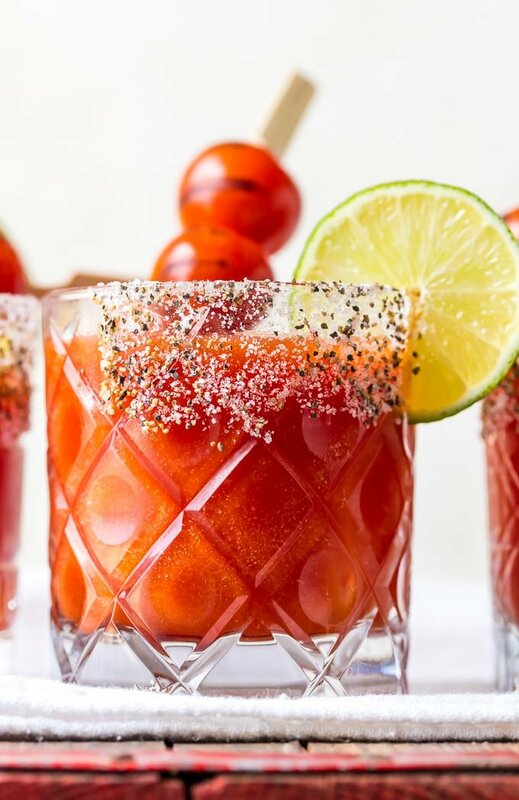 This tomato margaritas recipe is basically just a classic margarita mixed with a homemade tomato puree. So the main part of this recipe is making the roasted tomato puree. It’s made up of fresh cherry tomatoes, garlic, olive oil, salt & pepper, and chili powder. It’s easy to make and adds so much flavor to the margarita. 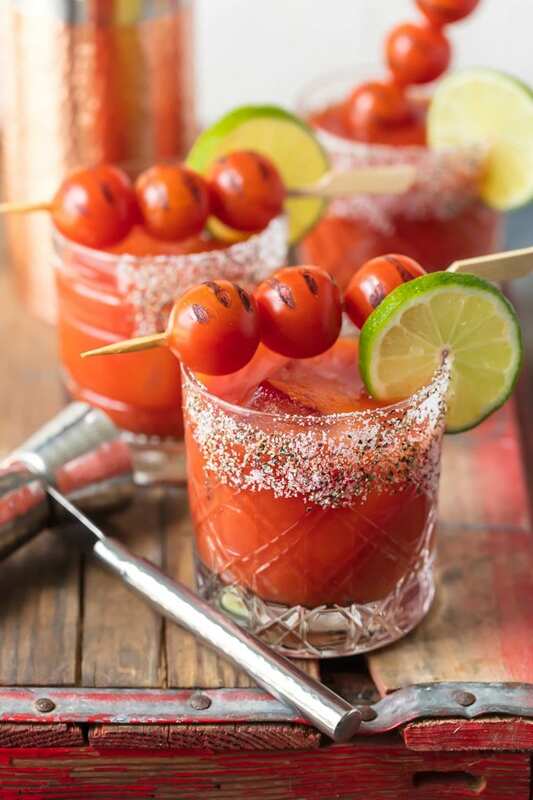 To serve the tomato margaritas, wipe the rim of the glass with a lime wedge and dip it in a salt/chili powder mixture. Pour the margarita over ice and garnish with a lime wedge. This roasted tomato margarita recipe is going on the list of the BEST margaritas. I’ve made quite a few of them over the years, so I made an entire GUIDE dedicated to margaritas and the best recipes out there. 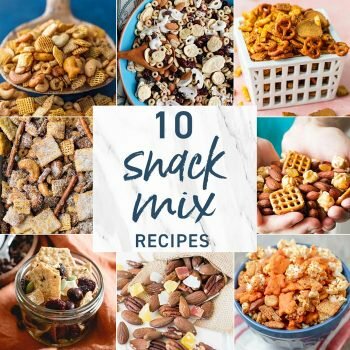 It’s a mix of some of my favorite recipes from both myself and other bloggers. There are 30 margaritas recipes to choose from, so no matter your preference (classic, frozen, flavored), you’ll find one you like on the list. Plus you’ll find answers to all of your margarita questions, the best tools and ingredients to make them, and how to make a simple margarita. Check out the full Margaritas Guide right here! I’ve been so excited about sharing this Roasted Tomato Margarita recipe with you guys because I know you’re going to LOVE IT! It’s sooooo good and it’s an easy way to change things up. This is a fun cocktail to serve at parties and I think it looks so nice with that tomato red color and the salted glass rim. Enjoy! See the recipe card below for details on how to make this Roasted Tomato Margarita Recipe! Roasted Tomato Margaritas put a twist on some classic cocktails. 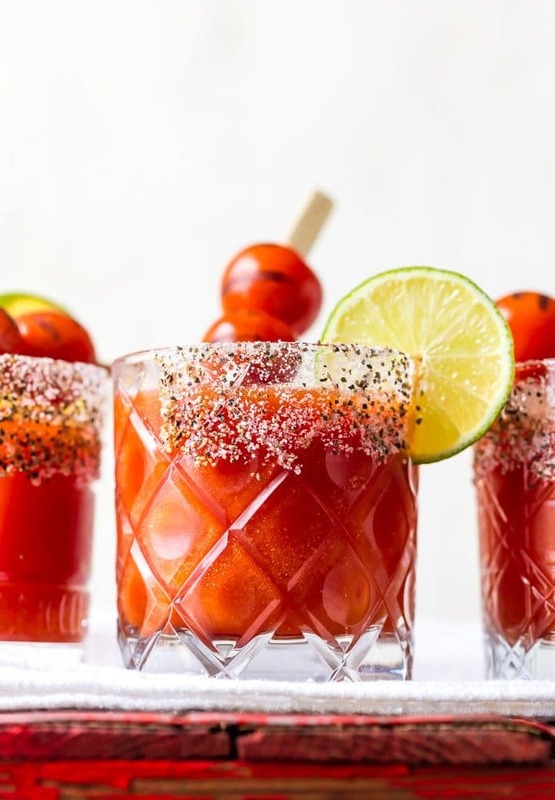 Mix the tequila and lime juice of a margarita with the tomato juice of a Bloody Mary, and you've got one fun and delicious drink. This easy margarita recipe is sure to please! Heat oven to 350F. In a large bowl, toss together the tomatoes, olive oil, garlic, salt, and pepper, and chili powder. Spread tomato mixture onto a baking sheet and roast in the oven for 15 minutes. Add tomatoes to a high powered blender with ¼ cup water. Blend on high until totally smooth. Add tomato puree to a cocktail shaker with tequila, lime juice, and ice. Shake, shake, shake! Mix together the chili powder and course salt on a small plate. Use a lime wedge to wipe the rim of your glass, and then dip in the chili/salt combination. Fill glass with more ice. Pour Margarita into the glass and garnish with lime wedge. Cheers!